One of my more eccentric 'quirks' is that I have trouble telling people what I do for a living. When cornered, I try to get away with saying, "I work from home" - and hope they'll assume I'm mass knitting tea cosies or something similar. Well, that comment came back to bite me last month; I moved to a new house and found it had no landline and therefore no Internet. How have I managed to stay online? With a mobile Wi-Fi, Internet cafés and the generosity of friends; now I was working anywhere but home! Ironically, it was at this point Johanna Grassick asked if I would contribute to a series of blog posts she was collating for Novelistas Ink, entitled Where I Write. My first thought was wondering whether I could get away with writing a post about the local Waterstones café, which had become my new 'office'. But while writing that post, it got me thinking about where I write and how much writers rely on the Internet for their work - research, keeping in touch with other authors and readers, as well as promotion. The flipside is that the Internet is a huge distraction - which is why writing retreats are so popular. Now I had my own Internet-free writer's retreat - only without the retreat bit! 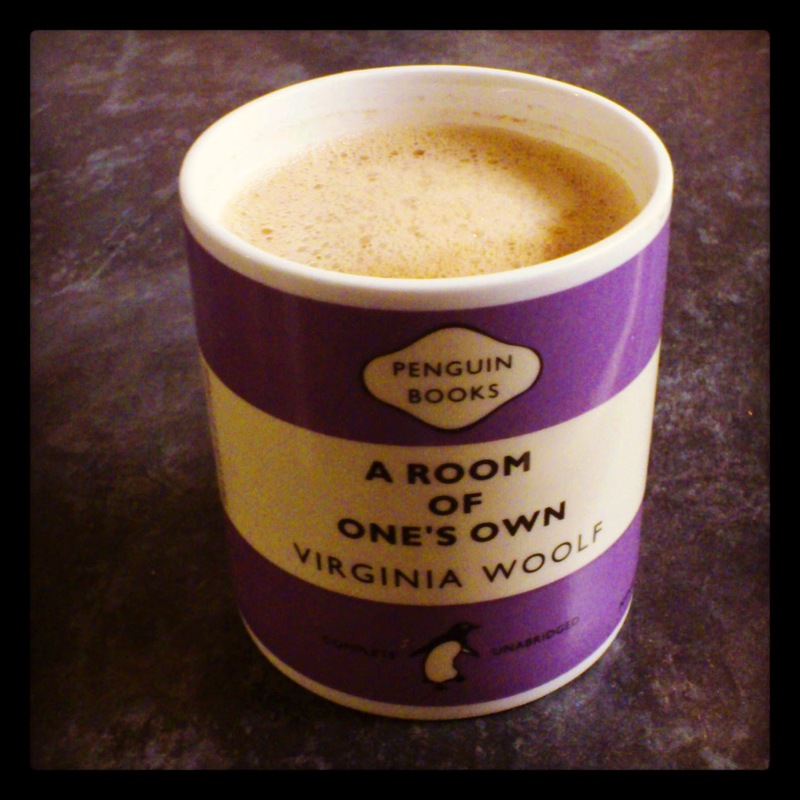 So, does it really matter whether I work in a café, a spare room or my own study? And then I claimed my first 'study'! We had moved to a rambling Victorian house, where the dining room was at one end of the building and the kitchen at the other. So I claimed the redundant dining room for my study. I had an entire wall of shelving so, for the first time ever, I could get all my books out of their boxes. Heaven! 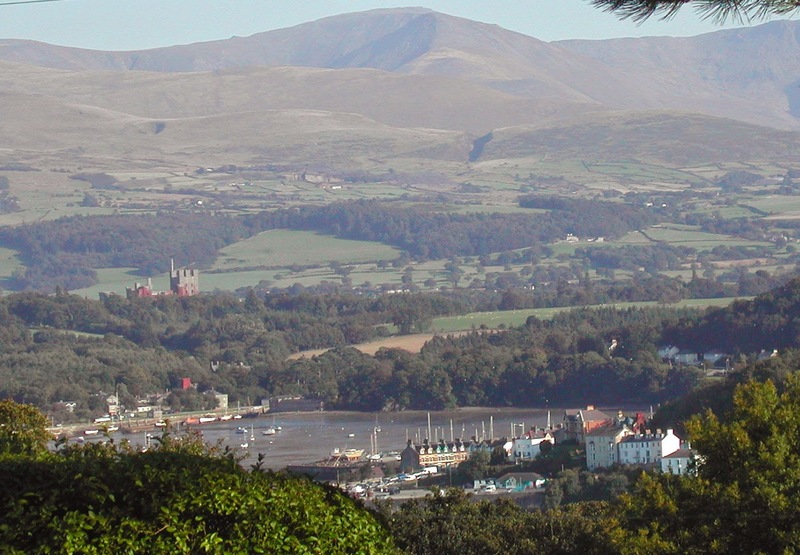 It had a huge bay window, with a beautiful view of Snowdonia, and I positioned a sofa there - with the idea I could recline and daydream about my plots while I admired the scenery. Of course I never had the time to do that! Incidentally, this was the first time I put a room from my own house into one of my books - my study also became Alicia's in Nemesis. The castle you might just be able to see to the left of this picture is Penrhyn Castle and it became the model for Hurst Castle in the same book. Then we moved again. My books went back in their boxes and I ended up with another dining room for a study, which was probably the prettiest I've had, with views across the Menai Straits to Mount Snowdon itself. What have I learned from these upheavals over the years? Well, despite my whinging, it turns out I can write anywhere. It doesn't matter if I'm in a spare room or a café. I don't need a study and I don't need an Internet connection - in fact, as any author will tell you, we get more writing done without it! It turns out that all I really need to write is ... my laptop and me. Can't wait to read about your new writing room, Louise! Thank you, Terry! 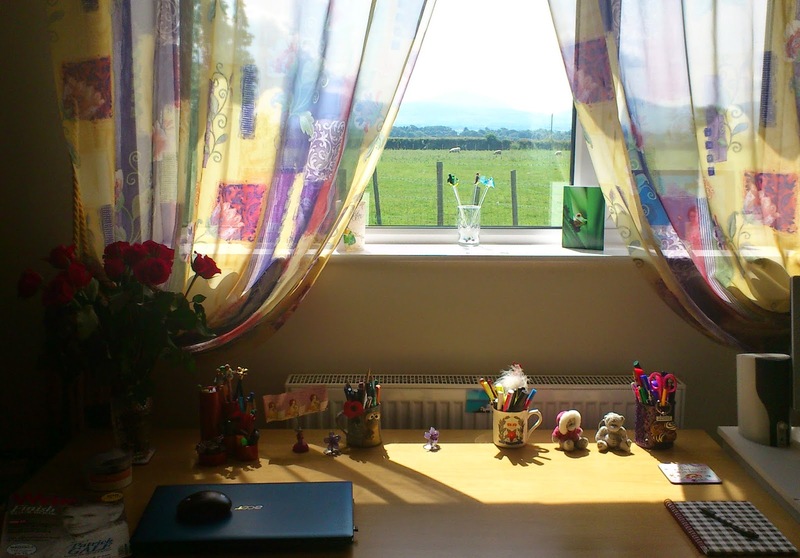 Funnily enough, that window was so high that when I was writing, I couldn't actually see Snowdon - only the sky! Like you, my husband works with his back to the window but I like to daydream! Ahhh a 'writing room' would be heaven! We only have one downstairs room (apart from kitchen and hall) and no spare room (I have two kids) but I can write in the bedroom as we have a fold down desk in there. I couldn't have finished my last book without my trusty ipad as the tiny tables on my commuter trains were my 'office' for the past two years! I can write anywhere really if I have inspiration and unlike Terry I usually have music on in the background (I got used to it because I needed to drown out the sound of commuters!). Really good article Louise and one which will, I am sure, generate a lot of discussion! So enjoyed this post, thanks for sharing your home and journey with us, Louise. My favorite writing room was, believe it or not, the laundry room/area in the last house we lived in. Why the laundry room, you ask? Good question, since it was in the basement...an unfinished basement btw, with bare concrete floors. The thing is I felt I was ‘away’ when I was down there. And let’s be honest here, running up and down those stairs got OLD on laundry day. And every day seemed to be laundry day at the time. (Putting the laundry facility in the basement in a 4-level house had to be a man’s idea!) Still…the privacy was pretty much a given: someone might call down the stairs if they needed something, but they weren’t about to venture down those stairs – too afraid I'd put them to work folding, hanging, etc. There was this sofa. Ugliest sofa you ever saw, I hated that thing, but it had been a freebie a hundred years ago. And I guess it wound up down there like so many things: in case one of the kids needed it. Either that or nobody wanted to be seen hauling it off. Anyway, I eyeballed it one day and remembered how comfortable it was. Next thing I knew I was spreading a quilt over its ugly self. I then gathered some pillows – none of which had any correlation to the other – colors and patterns screamed. But they were perfect for my needs. And an old coffee table. My sister called it Ugly American, but it was good, solid wood and I could plop my feet on it and not worry about damaging it because it was already done for. I added a small tv (rarely turned on) and one of those enormous old stereos once called ghetto blasters for those times I needed a little music to soothe the savage… The thing was in sad shape, the button for the tuning dial missing, but I managed to get it set on my fave station. Great sound! I anchored all this on a worn cheapie Oriental rug (no idea who left that there) and Voilà! my writing oasis was born! There was a small, high window and now and then I glimpsed a bird or a squirrel but other than that, I was alone. A small oblong pillow tucked in at my back, feet up, I wrote. I have a lovely room to write in now, with a big window looking out on nothing but trees. It has nice furnishings, even a color scheme. But this is the thing: when I’m writing my surroundings are only important in that I need to be comfortable. Pretty doesn’t signify. Nor ugly. And I kind of miss the hum of the machines. And the feeling of being ‘away’. This is such a great story, Jen! Your writing room sound a bit like a bat cave - only more comfy! Have you ever thought of starting your own blog up? This is such a lovely piece of writing - far too lovely to be buried down here in the comments section! Get blogging! Heavens! Louise, thanks much! So happy you enjoyed my ramblings. Put my fingers on a keyboard and I blather. I can blather in a dm! :) You just made my day! And you don't think they'd come get me, those men in the little white jackets, if I blogged the mish-mash in my head?